A second club was left waiting for prize money and grant payments owed to it by the FAI when former chief executive John Delaney gave a €100,000 loan to the embattled association, documents seen by the Sunday Independent show. Bray Wanderers contacted the FAI in March 2017 seeking to access €22,000 it was owed in outstanding prize money, Uefa youth development funding and other grants. It was left waiting more than five weeks for partial payment. Emails and accounting documents show the FAI told Bray there were issues with the financial interactions with clubs. Less than a month after Mr Delaney gave the association a €100,000 "bridging loan", the FAI's then director of finance, Eamon Breen, told Bray: "I will address the matter of more regular reconciliations being provided to clubs. Please allow me some time to design an efficient internal process for this to happen." Dundalk FC also encountered delays accessing funding through the FAI at the same time as Bray and referees were engaged in a dispute as they sought assurances match expenses would be paid on time. Another Premier Division club told the Sunday Independent yesterday it regularly has had issues with securing prize money from the FAI. An email from Breen shows the FAI sought to write off €10,000 of the €22,000 owed to Bray against affiliation fees the club was due to pay later in the year. Initially it only paid €12,000 of what was due to the Co Wicklow club. Gerry Mulvey was one of the club's majority shareholders in 2017. He told the Sunday Independent the additional €10,000 was eventually paid but only after Bray said it was unhappy with the arrangement laid out by the FAI. "The money was never going to solve all of the club's problems but you would have thought it would have been more forthcoming from them [the FAI]," he said. Financial statements seen by the Sunday Independent show the club was due €21,881.40 from the FAI at the end of 2016. They show the club was liable for bills to the FAI totalling €32,977. This sum included two instalments of €10,000 and €7,000 to cover Bray's fees to be affiliated with the FAI and a further €11,590 to cover referee fees during the 2016 season. However, these costs were offset against money owed to Bray from the FAI. This included €34,591 Bray was due from Uefa to cover youth development costs. Bray was due €19,500 from the FAI in prize money for finishing sixth in the 2016 SSE Airtricity League and a €945 grant for travel expenses. When these sums were reconciled with money Bray owed to the FAI for yellow and red card fines and other fees, the club was €21,881.40 in the black. Emails seen by the Sunday Independent show Bray's then chairman, Denis O'Connor, wrote to FAI accountant Yvonne Tsang seeking payment details on March 24, 2017, as the club sought to draw down funding. This came just five days before Dundalk contacted the association seeking €300,000 to cover the costs needed to upgrade its artificial pitch. Dundalk received a series of staggered payments from the FAI over the next month. Bray were not paid until May. Last week, Mr Delaney told the Oireachtas Sport Committee he had an internal finance meeting at the FAI with Ms Tsang and Mr Breen on April 25, 2017. 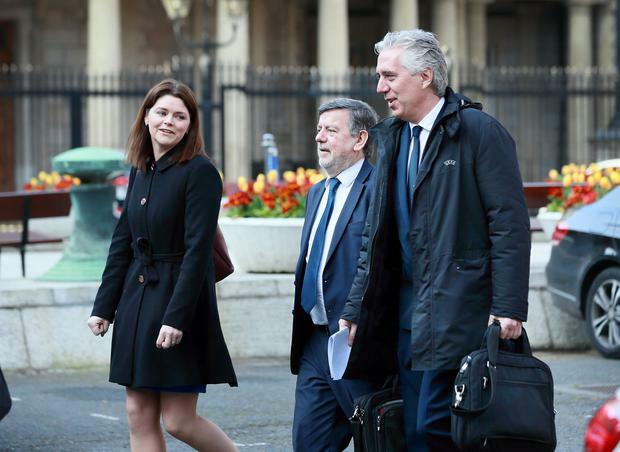 "I was advised at this meeting that if all cheques and FAI bank transfers issued to third parties at that time were presented for payment, that the FAI would exceed its overdraft limit of €1.5m on its bank accounts with the Bank of Ireland," he said. Mr Delaney then offered to write a cheque for €100,000 "as a precautionary measure" and told Breen to lodge the cheque if it was clear the association's overdraft was going to be exceeded. The following day, Mr Delaney received a phone call saying the funds were needed and would be paid back. Two days after Mr Delaney wrote the cheque, Bray contacted the FAI again about the money it was owed. Emails show Bray's FAI accounts were not reconciled until May 18, 2017. Five days after the accounts were reconciled, Mr Breen wrote to Bray. He said €12,000 would be paid directly to the club and "€10k allocated against" the affiliation fee Bray was due to pay later in the year. The FAI was contacted by the Sunday Independent but it failed to comment. Bray Wanderers chairman Niall O'Driscoll said League of Ireland clubs find it difficult to manage cash-flow. "Any improvement in the systems that help that will always be welcomed," he added.